In tribute to the finest holiday that was ever invented, I shine a spotlight on an artistic collaboration that we in the U.S. had no access to — unless you had the money for an international flight and a strong working knowledge of German. 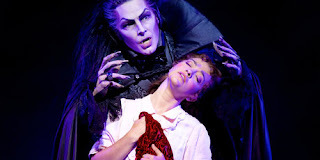 Now not one but two fully subtitled videos of the Austrian musical Tanz Der Vampire are on YouTube. I focus on the earlier production here since it was not only recorded more professionally but it was closer to the original vision of the show, as personally directed by Roman Polanski, who co-wrote and directed the source material, the horror farce The Fearless Vampire Killers, or Pardon Me, But Your Teeth Are in My Neck (1967). The show began in 1997 in Austria as directed by Polanski, but this recording of it hails from Germany in the early 2000s. I have mixed feelings about FVR. Polanski’s farces pale beside his brilliant darkly humored pictures (like Bitter Moon). The reworking of the film for Tanz, however, is fascinating in that the stage show takes its characters and situations a bit more seriously — the result, no doubt, of the show running over an hour longer than the film. 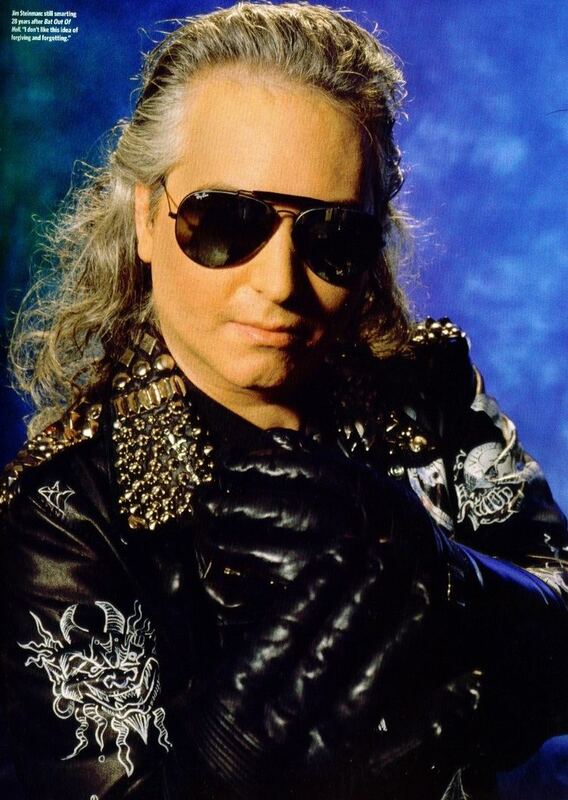 The other reason the show is a must-see is that it finds Polanski directing a stage musical scored by the king of pop-rock melodrama, Jim Steinman. I’ve rhapsodized about Steinman before (and noted his difficulties with librettos), so I will simply note that, since we never got to see the proposed “video album” for Steinman’s girl-group project “Pandora’s Box” that would’ve been directed by “Unkle Ken” Russell, we can content ourselves with a Broadway/West End-style musical with Steinman music and Polanski visuals. As for L’affaire Polanski and the fact that his latest film, Based on a True Story (2017), co-written with Olivier Assayas, was picked up by Sony Pictures Classics but not released in the U.S., it has to be said yet again that one *must* separate the art from the artist or one will only experience art from squeaky-clean hands – and who wants any more Spielberg-Ron Howard-Tom Hanks-Tyler Perry-Marvel movies? 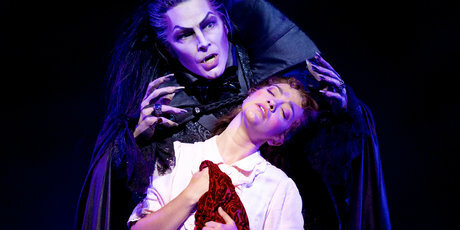 The sets are large and the cast is filled with “background vampire” singers and dancers. The key ingredient, though, is Steinman’s music, which, true to form with Jim, consists of songs that he composed for earlier projects, both musicals and pop-rock albums. The most-heard tune in the piece is “Total Eclipse of the Heart,” which is the central vampire’s signature theme and is repeated over and over in the show. Steinman has been quoted as saying that he used the very well-known hit song as a kind of place holder for some other song to be written later. Given that the tune is the central piece of music, I doubt he threw the song in there provisionally. There is certainly something amazing about hearing Steinman’s Wagnerian pop-rock in German. For decades now he has crafted songs that require singers with “big” voices and a solid vocal range (well… maybe not Air Supply), and his aim was always to write Broadway musicals. Hearing his music in German is a hand-in-glove fit. Tanz was his first big-budgeted musical to become a hit (it has run in various permutations in Germany over the past 20 years). That’s a chronological distinction, since an earlier collaboration with Andrew Lloyd Webber, Whistle Down the Wind, flopped in the U.S. in ’96 but ran for several years in the West End, starting in ’98, a year after Tanz opened in Austria. Steinman’s current musical, Bat Out of Hell, is wisely being toured around the UK (where it’s done very well) and North America before a Broadway run is even considered. One other individual should very definitely be highlighted here. Michael Kunze wrote the libretto adapting Polanski’s film to the stage. He also wrote the German lyrics, which, as seen here (in rhyming couplets in English), confirm the show’s status as an “almost operetta,” since the dialogue is minimal and the songs drive the plot entirely. Kunze has written German lyrics for many British and American shows, has had a number of his own hit musicals in Germany, and wrote and produced the disco hit “Fly, Robin, Fly” by Silver Convention (!). It should be noted that the very short-lived American version of the show starring Michael (“Phantom”!) Crawford had a troubled production and ultimately flopped big-time on Broadway. 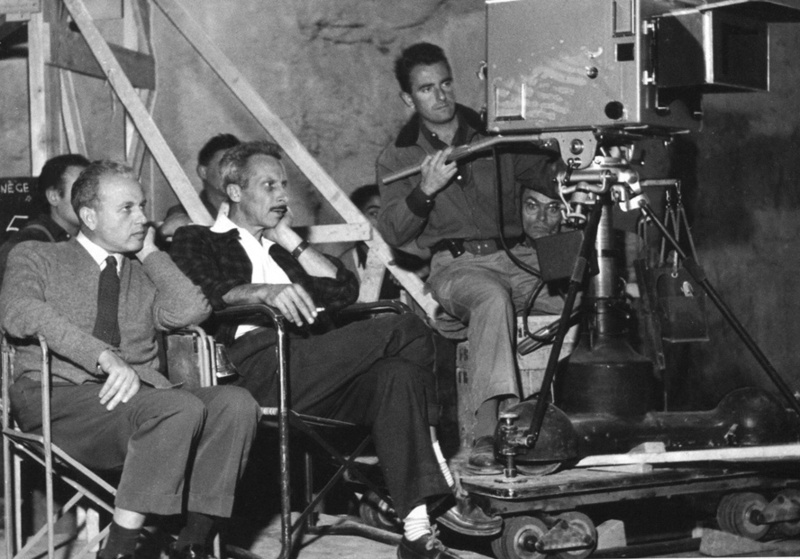 Steinman was initially hired as co-director, then fired, and he has never spoken well of the show, titled (rather obviously) Dance of the Vampires. By the time of the American failure, Polanski was long gone from the project. So here is all of Tanz from its German incarnation. The YT poster has broken it into seven segments, each of which has its standout scenes and songs. Note: The lyrics seen here are indeed the English-language versions of the songs. So I have no idea if the precise original lyrics of “Total Eclipse” were sung in German, but it’s highly unlikely. The first part has an amazing paean to garlic (tongue in cheek, of course) and the first appearance of “Total Eclipse” as the vampire’s signature song. The second part has a very Gilbert and Sullivan-esque song sung by the professor character (played in Fearless Vampire Killers by Jack MacGowran), as well as the first big duet between the youthful sidekick of the professor and the daughter of the innkeeper (played in the film by Polanski and Sharon Tate). The third part leads up to the famed “Jewish vampire” scene (which explains why one character looks like he’s Fagin and/or a Semitic stereotype — the initial scenes are set in a shtetl, and Polanski and his original co-scipter Gerard Brach provided a nice comedic pay-off to go with that choice of location). The fifth part contains another big ensemble number — “Eternity,” performed by a host of vampires after they exit their coffins. The sixth part is the finale (the seventh video contains the bows), leading up to the big closing number, “Dance of the Vampires.” The song is really “Tonight Is What It Means to Be Young,” an incredibly rousing Steinman song from the Walter Hill film Streets of Fire (1984). It’s a great way to end the show – kinda like Rocky Horror, but if “Time Warp” was the finale. I finished writing this piece two weeks ago, but in the interim three more books about Becker arrived in the mail. The first, Becker par Becker by Jean Becker (Editions PC, 2004), offers an interesting package of cut-and-paste quotations. The second, Jacques Becker: etudes, textes et scenarios inedites... edited by Claude Beylie and Freddy Buache (1991), contains invaluable documents by and about Becker — his articles, unproduced scripts, interviews with colleagues, essays about his work, and a critical roundup of contemporary comments on his films. 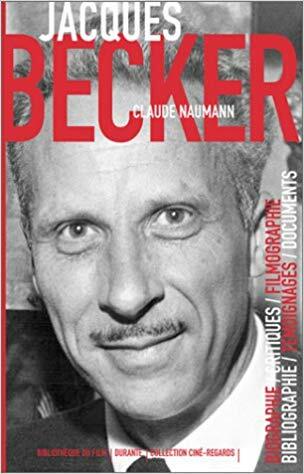 The third book, Jacques Becker by Claude Naumann (BiFi/Durante, 2001), is a more “written” book that has only one author and includes a full, nearly 100-page biography of Becker before the “documents,” which overlap with the Beylie/Buache book but also include new, unique interviews and other uncollected articles by Becker. These books have given me additional perspective on Becker, and so I open this second and last part of my appreciation with more information about the man and his art. One of the most valuable pieces in the Beylie-Bauch book is by the master filmmaker Alain Resnais, who speaks about the fact that Becker was a classical filmmaker and an innovator at the same time. Also, for sheer perversity’s sake, I will note that Becker’s title is an eerie foreshadowing of Jerry Lewis’s “Total Filmmaker” label, which in itself was a slangy, American way of expressing the auteur concept. 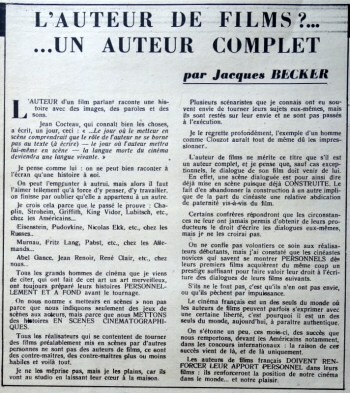 Another moving article by Becker that appears in the Beylie-Buache and Naumann books is “Le cinema a besoin d’amants” (The cinema needs lovers, which appeared in Arts in Nov. 1959; found in Beylie-Buache and Naumann). The piece is a rebuttal to criticisms that the “nouvelle vague” filmmakers were too young to be making features. He starts off bemoaning the “New Wave” label and declares that age has little to do with artistic talent. He notes that he was an assistant of Renoir for eight years, and while he valued the lessons he learned at the side of the master, he wished he had started his own filmmaking career earlier. 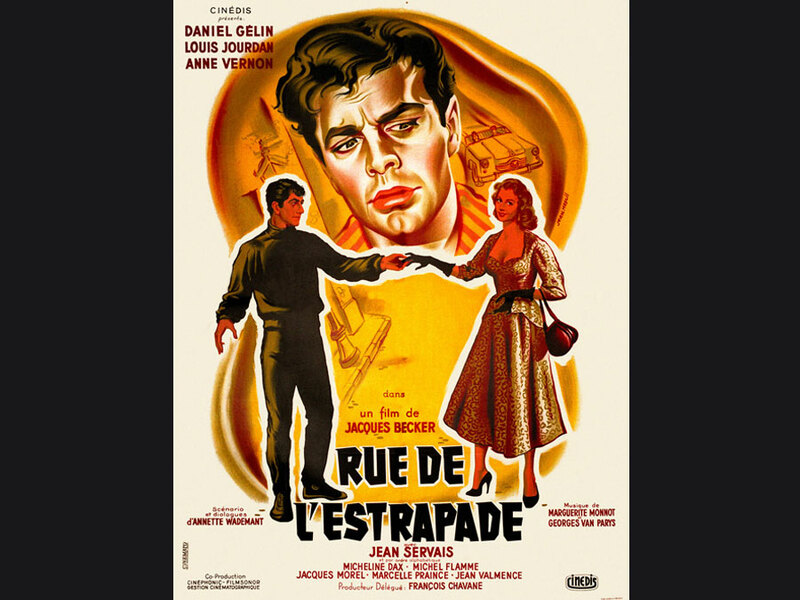 Becker returned to familiar ground with the utterly charming Rue de l’estrapade (1953). As noted above, the film is basically a fourth entry in what critics called Becker’s “youth trilogy.” It is, like the preceding films, a blissful blend of romantic longing and out-and-out comedy, as well as a beautifully constructed sketch of a community. The plot sees a young wife (Anne Vernon) leaving her cheating husband (Louis Jourdan) to live in a small apartment. While her husband breaks up with his mistress and tries to make amends with his wife, the wife is seduced by both a bisexual fashion designer (his boyfriend’s reappearance during the seduction being a fascinating moment in a Fifties movie romance) and a bohemian musician (Daniel Gelin, again!). Becker once more delivers a detailed sketch of a community — in this case the inhabitants of the apartment house Vernon’s character moves into. One of the film’s best moments, however, occurs early on: Jourdan dons Vernon’s scarf for a moment and she takes the opportunity to act like a man and sexually harass him while he is overwhelmed by her overtures. It’s a surprising and endearingly odd scene, which indicates Vernon’s character is more multifaceted than her husband gives her credit for. 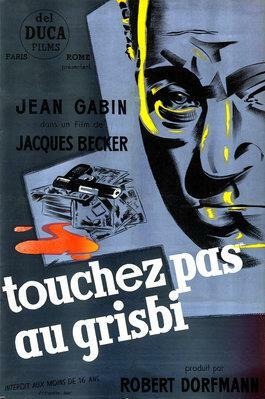 Becker’s next film, Touchez pas au grisbi (1954), made him a legend in noir cinema. The film is radically different because the “big caper” has occurred before the film begins. We are witness to the scramble for loot (“grisbi”) and, again, see the code of honor among the more noble crooks. The noblest of all the crooks depicted here is Max (Jean Gabin), a meticulous and dapper criminal who wants to fade out of the “milieu.” He is dragged back when his sidekick and best friend (Rene Dary) is kidnapped by a rival gang leader (the terrific Lino Ventura, in his big-screen debut). Max has to decide whether to give up the loot for the life of his friend, and we are certain from the first what his response will be. 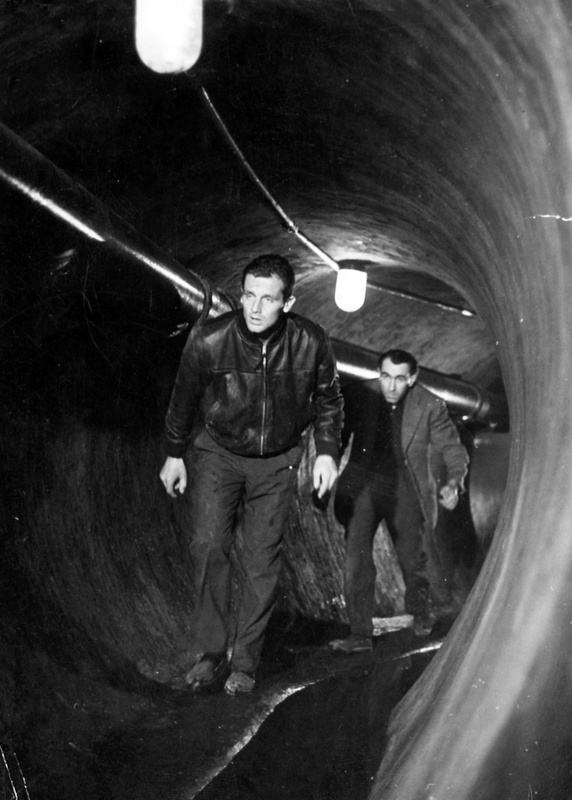 The two most jarring, ultimately welcome aspects of Grisbi are its mellow pace, which serves to introduce the characters and their environment in detail (including Max’s extraordinary hideout — a secure, fully stocked luxury apartment) and the fact that these gangsters deal in matters that American movie gangsters never mentioned before the late Sixties, namely prostitution and drug dealing. Max’s sidekick in fact admits that if he were younger that he’d be pimping off his girlfriend, played by a young and very beautiful Jeanne Moreau. The film’s theme of sacrifice for a friend links it to Casque d’or and the indelible work of Becker admirer Jean-Pierre Melville. Melville’s Bob le flambeur (1956) was unfavorably compared with Grisbi, but they are in fact complementary, in that they both discuss the theme of aging in the criminal world and do not show the big caper that drives their plots. “The movie was ignored by the critics upon its release and Truffaut himself was embarrassed by its failings. Again, he used the art of paradox to extricate himself from a difficult position, subscribing to Becker's body of work, ‘with no exception,’ in the name of coherence in taste. 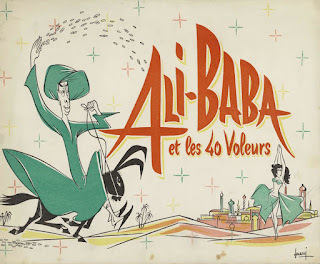 ‘Even if Ali Baba were a failure, I would still defend it by virtue of the auteur theory to which I and my fellow critics subscribe. Truffaut was being both kind and doctrinaire in this article. 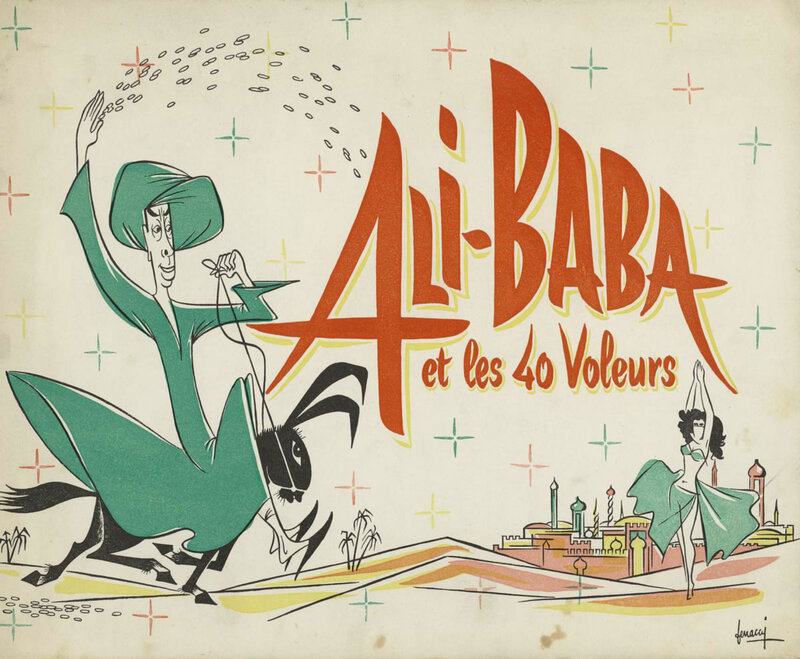 Ali-Baba is a light, frothy vehicle for the big-toothed comedian Fernandel. It has a gigantic budget for a Becker film — with large, detailed sets and hundreds of extras — and is pleasant and amusing. The plot is a trifle about a servant who falls in love with a dancing girl owned by his sultan boss. The most interesting aspect of the production is that Becker hired black actors to play the Arabic characters and an Egyptian actress to play the lead female role, something that would never have been done in the U.S. in the mid-Fifties. 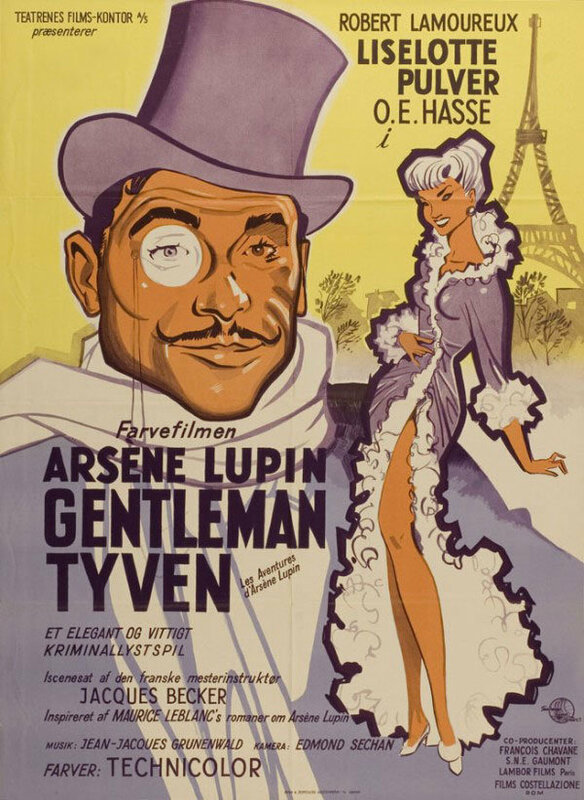 Becker’s second work-for-hire is his only other color feature, The Adventures of Arsene Lupin (1957). Like Ali-Baba, the film has very little that is “Beckerian” about it. Any talented French director could’ve made the film in the same manner. Also, like Ali-Baba, the film has a much bigger budget than Becker was used to working with. Robert Lamoureux (looking like the later thin and aged Johnny Hallyday) plays the title role, a seasoned thief who was featured in a series of best-selling French novels. Lupin is a master of disguise who steals, in the film’s lively first half, valuable paintings during a high society party and jewels from a pair of unwitting jewelers. The film slows down to a crawl with the third caper, in which Lupin robs a fortune from the Kaiser. Lupin does indeed test the auteur theory, but Becker certainly did his best with the material. While watching the third caper unfold oh, so slowly, one is amazed that the man who made this film had previously made the tight, concise Casque d’or and Grisbi. 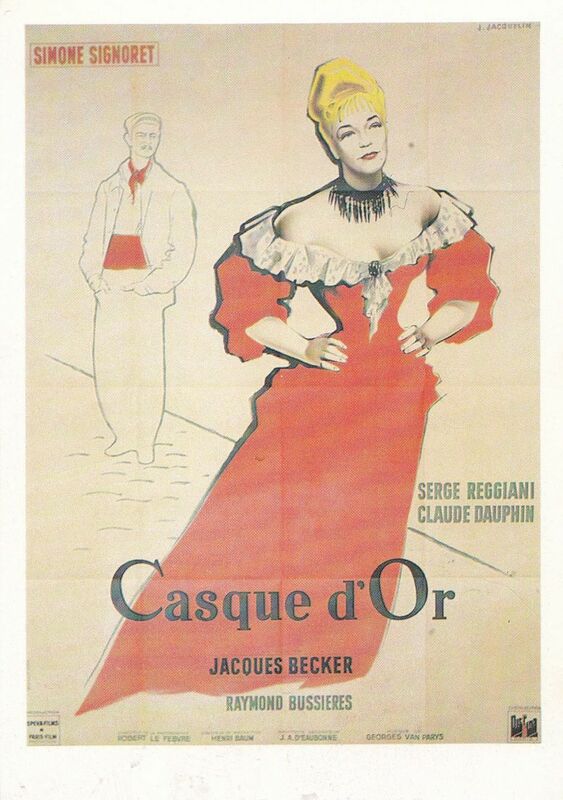 The next film, Montparnasse 19 (aka The Lovers of Montparnasse, 1958), is an “anti-biopic” that provoked extreme reactions from Becker’s fan base, especially critics. It was loved or hated, and it is, without question, one of the most downbeat of his films. 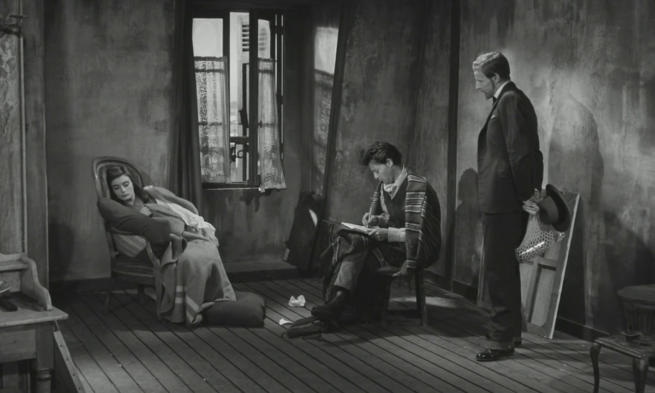 Some critics put it alongside Ali-Baba and Arsene Lupin as a work-for hire, because Becker took it on at the request of Max Ophuls, who died while he was preparing it. It certainly doesn’t belong in the category of its two predecessors, though. Becker made its storyline — the final weeks in the life of painter Modigliani (Gerard Philipe) — into a highly personal and very “Beckerian” film. As was common in Becker’s work, the film telescopes the time period in which the real events occurred. He concludes the plot with Modigliani’s death, leaving out the suicide of his wife Jeanne (played in the film by Anouk Aimee), which occurred shortly thereafter. 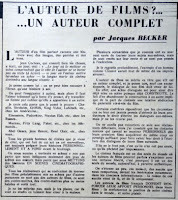 These decisions caused a major rift between Becker and scripter Henri Jeanson, but Modigliani’s daughter Jeanne presumably approved it, as she remained the technical consultant on the film. Montparnasse 19 is indeed loaded with cliches from the “tortured artist” handbook, and yet Becker’s portrait of the talented but self-destructive and severely alcoholic Modigliani is infused with a great deal of sincerity and a particularly pointed message about the artist’s need to sell out to make a living (perhaps Becker’s reflection on his two preceding films?). Andre Bazin gave it the highest of compliments by saying it was “the most ‘Bressonian’” of all of Becker’s films. Certain decisions made by Becker go against what would presumably have been Ophuls’ take on the material. 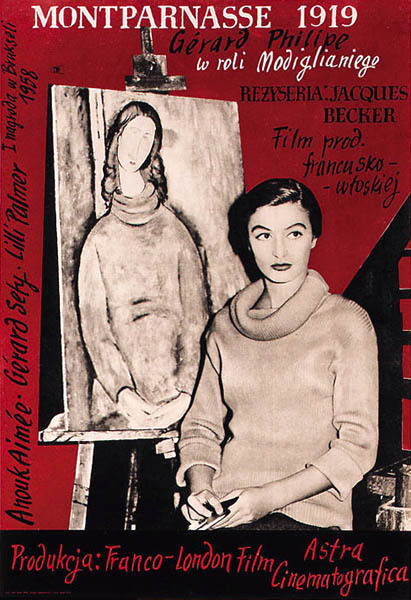 Firstly, Becker chose to make the film in b&w, forsaking the visual beauty of the painter’s work that could’ve been conveyed in color (as it stands, we see very little of Modigliani’s art head-on). He also used editing to convey emotion rather than using tracking shots, which were Ophuls’ specialty and his primary method of involving the viewer in the action. Lili Palmer is quite good as a South African journalist whose relationship with “Modi” includes regular beatings (which, it is indicated, she not only tolerates but enjoys). Anouk Aimee has the thankless (but tragically glamorous) role of Modi’s wife. Outshining them all is the great Lino Ventura, whom Becker transformed into an actor in Grisbi (he had formerly been a pro wrestler!). Lino was best known for playing crooks and cops, but here Becker wisely cast him as an art dealer who is following Modi around, waiting for his impending demise — and the resulting rise in value of his thus far worthless art. Lino is incredible in the film’s final scene, when his vulture-liked character finally gets his wish. At this moment Montparnasse 19 transcends all of its poetic sadness to proclaim its real message: Those who rule the art world are those who hold the purse strings. Where most critics were trashing Becker’s “anti-biopic,” one critic raved about the film’s blatant negativism. 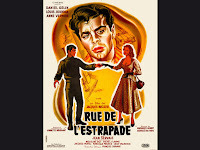 Godard wrote: “The sole greatness of Montparnasse 19 is that it is not only a film in reverse but the reverse of cinema…. [The film]… is probably the first film to be fundamentally, entirely negative…. “The fact remains. [It] will not prove to you that Modi loved Jeanne or that Beatrice loved Modi; nor that Paris is a wonderful city, that women are beautiful and men are weak; nor that love is pleasant, that painting is amusing or that painting is tedious; nor that art is more important than anything else or anything is more important than art. No, Montparnasse 19 will not prove that 2 + 2 = 4. Its purpose lies elsewhere. Its purpose is the absence of purpose. Its truth, the absence of truth. Montparnasse 19 will prove to you only that 2 – 2 = 0…. “After all, if a modern novel is fear of the blank page, a modern painting fear of the empty canvas, and modern sculpture fear of the stone, a modern film has the right to be fear of the camera, fear of the actors, fear of the dialogue, fear of the montage. I would give the whole of the post-war French cinema for that one shot, badly acted, badly composed, but sublime, in which Modigliani asks five francs for his drawings on the terrace of the Coupole. Based on a real event, the plot is as straightforward as possible: An inmate (Marc Michel) is moved to a new cell and is let in on an escape plan that the four men in the cell have been developing. The quintet work diligently to dig a hole, explore the tunnels under the prison, and exit via the sewers. Becker was stunningly meticulous in his approach (cue the opening quote of the first part of this piece), and his attention to detail is nothing short of dazzling (albeit a low-key brand of dazzling). The storyline begins in media res, the characters are quickly sketched and the time it takes them to dig the hole and journey through the tunnels and sewers is brilliantly telescoped, so that the proceedings are tense and yet incredibly quiet (no music appears on the soundtrack until the end credits). 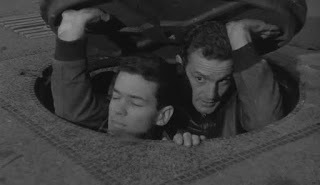 Granted, there was one major precedent for the film — Bresson’s immaculate A Man Escaped (1956). The similarities and differences between the films are instructive. Both are exceedingly quiet, rigorous studies of a carefully mapped out prison break. Bresson, however, created a hypnotic, spiritual work focused on one inmate’s efforts (he eventually joins up with one other inmate), while Becker made a quiet yet carefully emotional film about a group’s efforts, with the emphasis placed on friendship and community. Both directors used non-professional actors in the lead roles (with the exception in Becker’s film being the newcomer to the plan, played by Marc Michel). Bresson exclusively used non-professionals because he didn’t want the viewer to be distracted by acting flourishes. 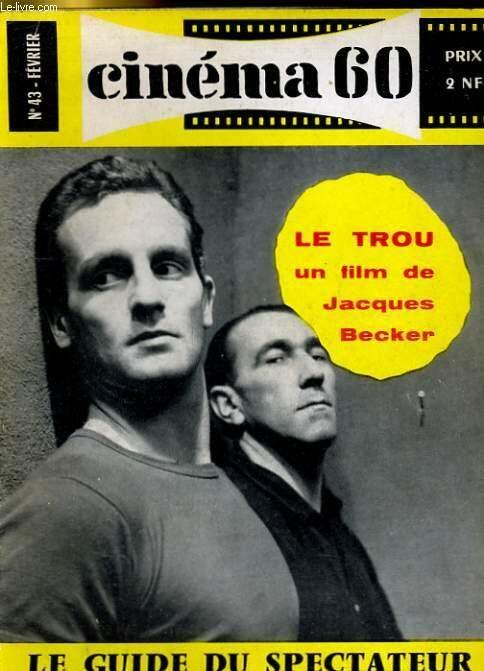 Becker, on the other hand, cast non-actors who could “feel” their way through the situations — his most impressive coup was to cast Jean Keraudy, a participant in the real prison break, to play himself in Le Trou. The most miraculous thing about Le Trou is how Becker evokes tension with such an understated and sober-minded approach — none of the action and tension that characterizes Hollywood prison-break pictures can be found here. It is a lean piece of filmmaking that, while containing numerous changes made by Becker and co-scripter Jean Aurel to the original novel by Jose Giovanni (who also took part in the real prison break in 1947), remains true to the atmosphere of whispers, secrets, and jerry-rigged solutions that drive the action. It’s very peculiar that this fact occurs in the Melville books (thanks to the original interview with Noguiera), but not in any of the Becker books — either to be proven or disproven. The fact that Becker in effect re-made the film in his friend’s studio is quite something, even if he only reshot certain takes in Melville’s studio and not the entire film, as Melville maintained (harkening back to Becker’s "not meticulous… but maniacal!” side). Like Bresson and Melville, Becker’s output was small but it changed French cinema forever. Thanks to Truffaut and Godard proudly citing him as an influence (and utilizing some of the hallmarks of his approach in their early films), Becker’s influence is still felt today. The legendary Andre Bazin came closest to the mark when he said that the viewer “comes to ‘love the characters independently’ of their place in the infrastructure of the drama or the film’s given genre.” [Bazin quote from “The Cinema of Jacques Becker: Four Original Reviews,” Film Literature Quarterly, Vol. 34, no. 4; quoted in Casas and Iriarte, Jacques Becker, p. 156]. One of the most unique things about Becker’s work is that he did indeed craft characters that you could fall in love with. Whether he was making a film about a young couple experiencing a lightly comic crisis or a bunch of hardened crooks realizing that age was their single worst enemy, the strength of Becker’s cinema lies in the likability and sheer charm of its characters. – Four vintage articles by Becker and one interview with him. [in French] La Belle Equipe website. Thanks to superior cineaste Paul Gallagher for helping me find articles and copies of the “minor” Becker titles on disc (none of the minor ones are really minor; the two color works-for-hire are indeed works-for-hire, though); to Librarie Antoine (39 bis rue Molitor in Paris) for their incredibly speedy and economical sale of the very-hard-to-find Beylie-Buache book; and to Bruce Goldstein and the Film Forum for doing a comprehensive Becker tribute for the first time in NYC in… well, forever.